Hi Friends!! Happy Sunday! 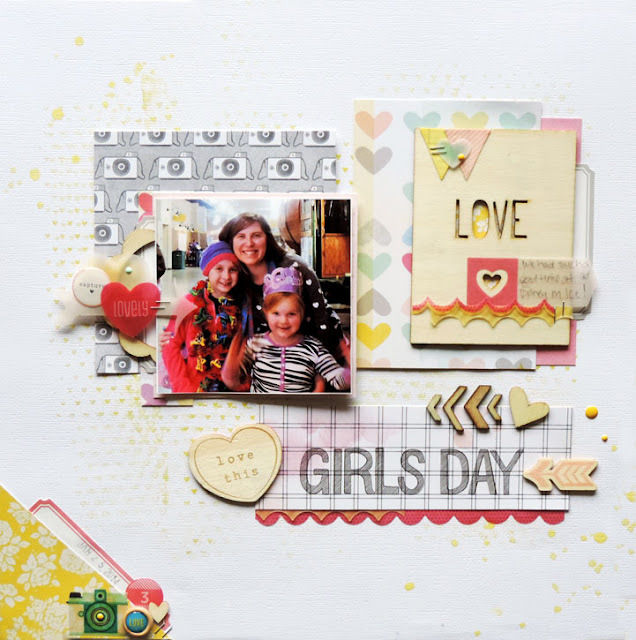 I am back today to share the new sketch that went up at Creative Scrappers, and my inspiration layout. I had just got some fun new supplies in when I sat down to work on this layout, and I knew that they would be perfect for this one. I used a photo of my girlies and me on our recent girls day out to see Disney Princesses and Heroes on Ice. I just had fun with this! I picked some of my favorite papers from the Dear Lizzy Daydreamer 6x6 pad, embellishments from the same collection and some Crate Paper...and just had fun. This sketch is perfect for that, so easy to interpret so many different ways. I know its one I can use over and over again! Love that! Now, head over to Creative Scrappers and see inspiration from the rest of the team, and play along for your chance at a great prize from Chic Tags!!! Have a great day, and take time to create something you love!! Really cute Amanda!! Love the new Dear Lizzy on your layout! So cute! And LOVE that you guys were able to have a girls' day! My girl and I just went to see Disney On Ice the other day! Always a good time!! Love your gorgeous page!! What a fabulous page Amanda!! Love Dear Lizzy and love the wood veneer! So sweet. I love all your little details You are always such an inspiration to me!